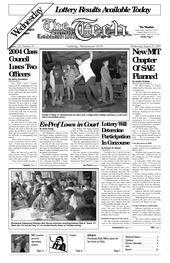 The MIT chapter of Sigma Alpha Epsilon fraternity may soon be rechartered. The 2004 class council announced the resignations of Class Secretary Rachana D. Oza ’04 and Social Chair Nadjia M. Yousif ’04 in an e-mail sent to the class of 2004 on Saturday. The Middlesex Superior Court has denied former Assistant Professor of Mathematics Maurice H.P.M. van Putten’s motion for a preliminary injunction to be rehired. Freshmen have shown strong interest this year in alternatives to mainstream lecture courses, especially in Concourse, which will have to run a lottery for the first time in many years, according to Concourse Director Cheryl A. Butters.